The English used in this user page may not be easy for everybody to understand. You can help Wikipedia by reading Wikipedia:How to write Simple English pages, then simplifying the page. The earliest known recorded observations of Mercury are from the Mul.Apin tablets. These observations were most likely made by an Assyrian astronomer around the 14th century BC. The cuneiform name used to designate Mercury on the Mul.Apin tablets is transcribed as Udu.Idim.Gu\u4.Ud ("the jumping planet"). [b] Babylonian records of Mercury date back to the 1st millennium BC. The Babylonians called the planet Nabu after the messenger to the gods in their mythology. The ancient Greeks of Hesiod's time called Mercury Στίλβων (Stilbon), meaning "the gleaming", and Ἑρμάων (Hermaon). Later Greeks called the planet Apollo when it was visible in the morning sky, and Hermes when visible in the evening. Around the 4th century BC, however, Greek astronomers came to understand that Apollo and Hermes both referred to the same body. The Romans named the planet after the fast Roman messenger god, Mercury (Latin Mercurius) which they equated with the Greek Hermes, because it moves across the sky faster than any other planet in the solar system. The Roman-Egyptian astronomer Ptolemy wrote about the possibility of planetary transits across the face of the Sun in his work Planetary Hypotheses. He suggested that no transits had been observed either because planets such as Mercury were too small to see, or because the transits were too infrequent. In ancient Indian astronomy, the Surya Siddhanta, an Indian astronomical text of the 5th century, estimates the diameter of Mercury as 3,008 miles, an error of less than 1% from the currently accepted diameter of 3,032 miles. However, this estimate was based upon an inaccurate guess of the planet's angular diameter as 3.0 arcminutes. In India, the Kerala school astronomer Nilakantha Somayaji in the 15th century developed a planetary model in which Mercury orbits the Sun, which in turn orbits the Earth, similar to the Tychonic system later proposed by Tycho Brahe in the late 16th century. The first telescopic observations of Mercury were made by Galileo in the early 17th century. Although he observed phases when he looked at Venus, his telescope was not powerful enough to see the phases of Mercury. In 1631 Pierre Gassendi made the first telescopic observations of the transit of a planet across the Sun when he saw a transit of Mercury predicted by Johannes Kepler. In 1639 Giovanni Zupi used a telescope to discover that the planet had orbital phases similar to Venus and the Moon. The observation demonstrated conclusively that Mercury orbited around the Sun. A very rare event in astronomy is the passage of one planet in front of another (occultation), as seen from Earth. Mercury and Venus occult each other every few centuries, and the event of May 28, 1737 is the only one historically observed, having been seen by John Bevis at the Royal Greenwich Observatory. The next occultation of Mercury by Venus will be on December 3, 2133. In June 1962 Soviet scientists at the Institute of Radio-engineering and Electronics of the USSR Academy of Sciences lead by Vladimir Kotelnikov became first to bounce radar signal off Mercury and receive it, starting radar observations of the planet. Three years later radar observations by Americans Gordon Pettengill and R. Dyce using 300-meter Arecibo Observatory radio telescope in Puerto Rico showed conclusively that the planet’s rotational period was about 59 days. The theory that Mercury’s rotation was synchronous had become widely held, and it was a surprise to astronomers when these radio observations were announced. If Mercury were tidally locked, its dark face would be extremely cold, but measurements of radio emission revealed that it was much hotter than expected. Astronomers were reluctant to drop the synchronous rotation theory and proposed alternative mechanisms such as powerful heat-distributing winds to explain the observations. Italian astronomer Giuseppe Colombo noted that the rotation value was about two-thirds of Mercury’s orbital period, and proposed that the planet’s orbital and rotational periods were locked into a 3:2 rather than a 1:1 resonance. Data from Mariner 10 subsequently confirmed this view. This means that Schiaparelli's and Antoniadi's maps were not "wrong". Instead, the astronomers saw the same features during every second orbit and recorded them, but disregarded those seen in the meantime, when Mercury's other face was toward the Sun, since the orbital geometry meant that these observations were made under poor viewing conditions. Ground-based observations did not shed much further light on the innermost planet, and it was not until the first space probe flew past Mercury that many of its most fundamental properties became known. However, recent technological advances have led to improved ground-based observations. In 2000, high-resolution lucky imaging observations were conducted by the Mount Wilson Observatory 1.5 meter Template:Dp. They provided the first views that resolved surface features on the parts of Mercury which were not imaged in the Mariner mission. Later imaging has shown evidence of a huge double-ringed impact basin even larger than the Caloris Basin in the non-Mariner-imaged hemisphere. It has informally been dubbed the Skinakas Basin. Most of the planet has been mapped by the Arecibo radar telescope, with 5 km resolution, including polar deposits in shadowed craters of what may be water ice. Reaching Mercury from Earth poses significant technical challenges, since the planet orbits so much closer to the Sun than does the Earth. A Mercury-bound spacecraft launched from Earth must travel over 91 million kilometers into the Sun’s gravitational potential well. Mercury has an orbital speed of 48 km/s, while Earth’s orbital speed is 30 km/s. Thus the spacecraft must make a large change in velocity (delta-v) to enter a Hohmann transfer orbit that passes near Mercury, as compared to the delta-v required for other planetary missions. The potential energy liberated by moving down the Sun’s potential well becomes kinetic energy; requiring another large delta-v change to do anything other than rapidly pass by Mercury. To land safely or enter a stable orbit the spacecraft would rely entirely on rocket motors. Aerobraking is ruled out because the planet has very little atmosphere. A trip to Mercury requires more rocket fuel than that required to escape the Solar System completely. 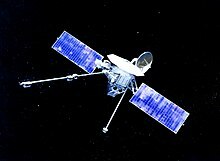 As a result, only two space probes have visited the planet so far. A proposed alternative approach would use a solar sail to attain a Mercury-synchronous orbit around the Sun. A second NASA mission to Mercury, named MESSENGER (MErcury Surface, Space ENvironment, GEochemistry, and Ranging), was launched on August 3, 2004, from the Cape Canaveral Air Force Station aboard a Boeing Delta 2 rocket. It made a fly-by of the Earth in August 2005, and of Venus in October 2006 and June 2007 to place it onto the correct trajectory to reach an orbit around Mercury. A first fly-by of Mercury occurred on January 14, 2008, a second on October 6, 2008, and a third on September 29, 2009. Most of the hemisphere not imaged by Mariner 10 has been mapped during these fly-bys. The probe will then enter an elliptical orbit around the planet in March 2011; the nominal mapping mission is one terrestrial year. The mission is designed to clear up six key issues: Mercury’s high density, its geological history, the nature of its magnetic field, the structure of its core, whether it has ice at its poles, and where its tenuous atmosphere comes from. To this end, the probe is carrying imaging devices which will gather much higher resolution images of much more of the planet than Mariner 10, assorted spectrometers to determine abundances of elements in the crust, and magnetometers and devices to measure velocities of charged particles. Detailed measurements of tiny changes in the probe’s velocity as it orbits will be used to infer details of the planet’s interior structure. The European Space Agency is planning a joint mission with Japan called BepiColombo, which will orbit Mercury with two probes: one to map the planet and the other to study its magnetosphere. Once launched, the spacecraft bus is expected to reach Mercury in 2019. The bus will release a magnetometer probe into an elliptical orbit, then chemical rockets will fire to deposit the mapper probe into a circular orbit. Both probes will operate for a terrestrial year. The mapper probe will carry an array of spectrometers similar to those on MESSENGER, and will study the planet at many different wavelengths including infrared, ultraviolet, X-ray and gamma ray. ↑ Schaefer, Bradley E. (May 2007). "The Latitude and Epoch for the Origin of the Astronomical Lore in Mul.Apin". American Astronomical Society Meeting 210, #42.05 (American Astronomical Society). http://cdsads.u-strasbg.fr/abs/2007AAS...210.4205S. ↑ Staff (2008). "MESSENGER: Mercury and Ancient Cultures". NASA JPL. Retrieved 2008-04-07. ↑ 5.0 5.1 The named reference Dunne was used but no text was provided for refs named (see the help page). ↑ Samsó, Julio; Mielgo, Honorino (1994). 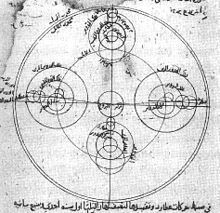 "Ibn al-Zarqālluh on Mercury". Journal for the History of Astronomy 25: 289–96 . http://articles.adsabs.harvard.edu/full/1994JHA....25..289S. ↑ Hartner, Willy (1955). "The Mercury Horoscope of Marcantonio Michiel of Venice". Vistas in Astronomy 1: 84–138. at pp. 118-122. ↑ Ansari, S. M. Razaullah (2002). "History of oriental astronomy: proceedings of the joint discussion-17 at the 23rd General Assembly of the International Astronomical Union, organised by the Commission 41 (History of Astronomy), held in Kyoto, August 25-26, 1997". Springer. ↑ Goldstein, Bernard R. (December 1969). "Some Medieval Reports of Venus and Mercury Transits". Centaurus 14 (1): 49–59. doi:10.1111/j.1600-0498.1969.tb00135.x. ↑ Ramasubramanian, K.; Srinivas, M. S.; Sriram, M. S. (1994). "Modification of the Earlier Indian Planetary Theory by the Kerala Astronomers (c. 1500 AD) and the Implied Heliocentric Picture of Planetary Motion". Current Science 66: 784–790. http://www.physics.iitm.ac.in/~labs/amp/kerala-astronomy.pdf. Retrieved 2010-04-23. ↑ The named reference strom was used but no text was provided for refs named (see the help page). ↑ Sinnott, RW; Meeus, J (1986). "John Bevis and a Rare Occultation". Sky and Telescope 72: 220. http://adsabs.harvard.edu/abs/1986S&T....72..220S. ↑ 20.0 20.1 Colombo, G.; Shapiro, I. I.. "The Rotation of the Planet Mercury". SAO Special Report #188R. http://adsabs.harvard.edu/abs/1965SAOSR.188.....C. Retrieved 2008-05-23. ↑ Holden, E. S. (1890). "Announcement of the Discovery of the Rotation Period of Mercury [by Professor Schiaparelli"]. Publications of the Astronomical Society of the Pacific 2 (7): 79. doi:10.1086/120099. http://adsabs.harvard.edu/abs/1890PASP....2...79H. Retrieved 2008-06-03. ↑ The named reference chaikin1 was used but no text was provided for refs named (see the help page). ↑ Evans, J. V.; Brockelman, R. A.; Henry, J. C.; Hyde, G. M.; Kraft, L. G.; Reid, W. A.; Smith, W. W. (1965). "Radio Echo Observations of Venus and Mercury at 23 cm Wavelength". Astronomical Journal 70: 487–500. doi:10.1086/109772. http://articles.adsabs.harvard.edu/abs/1965AJ.....70..486E/0000487.000.html. Retrieved 2008-05-23. ↑ Colombo, G. (1965). "Rotational Period of the Planet Mercury". Nature 208: 575. doi:10.1038/208575a0. http://adsabs.harvard.edu/abs/1965Natur.208..575C. Retrieved 2009-05-30. ↑ Dantowitz, R. F.; Teare, S. W.; Kozubal, M. J. (2000). "Ground-based High-Resolution Imaging of Mercury". Astronomical Journal 119: 2455–2457. doi:10.1016/j.asr.2005.05.071. http://ukads.nottingham.ac.uk/cgi-bin/nph-bib_query?bibcode=2000AJ....119.2455D&db_key=AST. ↑ L. V. Ksanfomality (2006). "Earth-based optical imaging of Mercury". Advances in Space Research 38: 594. doi:10.1016/j.asr.2005.05.071. http://adsabs.harvard.edu/cgi-bin/nph-bib_query?bibcode=2006AdSpR..38..594K&db_key=AST&data_type=HTML&format=&high=461152a03222956. ↑ Harmon, J. K. et al. (2007). "Mercury: Radar images of the equatorial and midlatitude zones". Icarus 187: 374. doi:10.1016/j.icarus.2006.09.026. http://adsabs.harvard.edu/abs/2007Icar..187..374H. ↑ "Mercury". NASA Jet Propulsion Laboratory. May 5, 2008. Retrieved 2008-05-29. ↑ "BepiColumbo - Background Science". European Space Agency. Retrieved 2008-05-30. ↑ Tariq Malik (August 16, 2004). "MESSENGER to test theory of shrinking Mercury". USA Today. Retrieved 2008-05-23. ↑ Ness, Norman F. (March 1978). "Mercury - Magnetic field and interior". Space Science Reviews 21: 527–553. doi:10.1007/BF00240907. http://adsabs.harvard.edu/full/1978SSRv...21..527N. Retrieved 2008-05-23. ↑ Grayzeck, Ed (April 2, 2008). "Mariner 10". NSSDC Master Catalog. NASA. Retrieved 2008-04-07. ↑ "MESSENGER Engine Burn Puts Spacecraft on Track for Venus". SpaceRef.com. 2005. Retrieved 2006-03-02. ↑ 46.0 46.1 "Countdown to MESSENGER's Closest Approach with Mercury". Johns Hopkins University Applied Physics Laboratory. January 14, 2008. Retrieved 2008-05-30. ↑ "MESSENGER Gains Critical Gravity Assist for Mercury Orbital Observations". MESSENGER Mission News. September 30, 2009. Retrieved 2009-09-30. ↑ The named reference MSGRgrayzeck was used but no text was provided for refs named (see the help page). ↑ 49.0 49.1 "ESA gives go-ahead to build BepiColombo". European Space Agency. February 26, 2007. Retrieved 2008-05-29. ↑ Fleming, Nic (January 18, 2008). "Star Trek-style ion engine to fuel Mercury craft". The Telegraph. Retrieved 2008-05-23. ↑ "Objectives". European Space Agency. February 21, 2006. Retrieved 2008-05-29. This page was last changed on 26 May 2013, at 08:40.